A critical factor in your organization's success is your ability to hire--and keep--good people. But in order to tackle the toughest recruiting assignments and keep your company running smoothly with great hires who are there for the long haul, you need to infuse both common sense and corporate street smarts into your approach. 101 Strategies for Recruiting Success offers practical tips of the trade from a recruiting professional with more than two decades of experience. The book gives you quick, powerful strategies for revitalizing your techniques, and provides sage advice in bite-sized chunks, designed for immediate implementation. You'll learn: * Proven ways to reel in great talent, including how to make your general recruiting operations proactive rather than reactive * 25 ways to find the people your company needs * Smart and efficient methods for conducting interviews and evaluating candidates * Specific advice on how to recruit for diversity * Effective retention tactics such as mentoring, performance appraisal, and anti-raiding strategies that begin even before the candidate is hired In addition, this invaluable guide includes a helpful ""Recruiting Excellence Workbook,"" a 35-day plan of simple exercises and specific to-dos for assessing and improving your staffing initiatives. 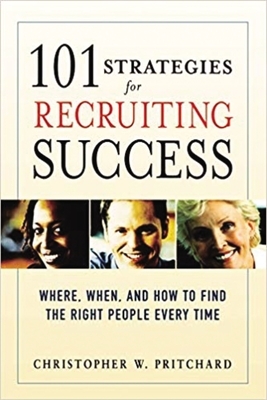 Both a revitalized approach for companies and a potent career booster for success-focused recruiting professionals, 101 Strategies for Recruiting Success is the key to putting the right people in the right jobs in the right places--and keeping them there. Christopher W. Pritchard, SPHR, has more than 20 years as a recruiting professional in both corporate and headhunter capacities. His recruiting consultancy has served respected clients such as General Electric, Coopers & Lybrand, Ernst & Young, Lotus Corporation, Dell, and Boeing. He has been a contributing author to the Wall Street Journal Employment Weekly and is a frequent speaker on recruiting, retention, and diversity. He lives in Bay Village, Ohio.